I am beyond thrilled to finally have finished this quilt. For awhile there, I was convinced I would never finish it. 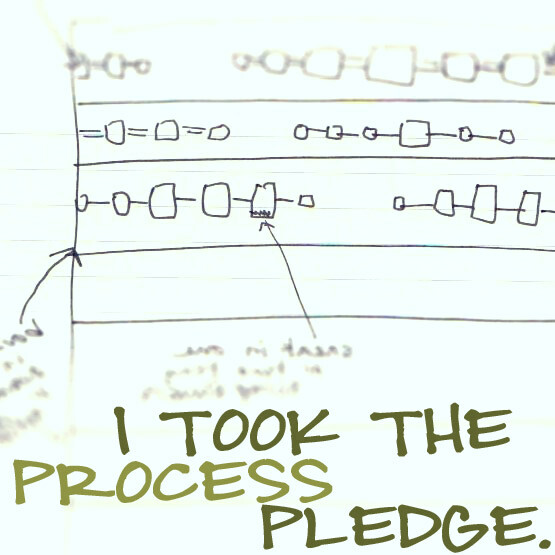 The process was long. Though only a twin sized, this is the largest quilt I have quilted on my home machine and I was using this project to learn free motion quilting, so I was definitely taking baby steps toward the finish. Since this is the quilt from my Road Trip Quilt Along, each block represents a state, so I quilted the state names below each block (can you see it?). 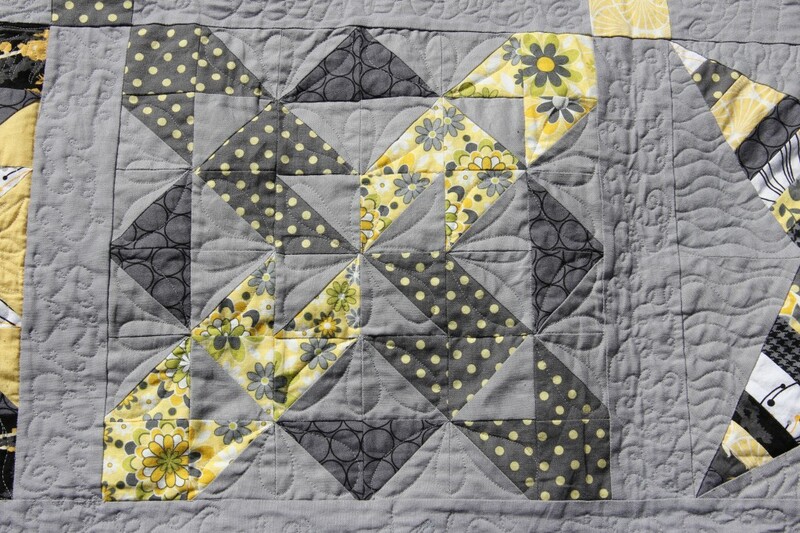 This is one of my favorite quilted blocks. 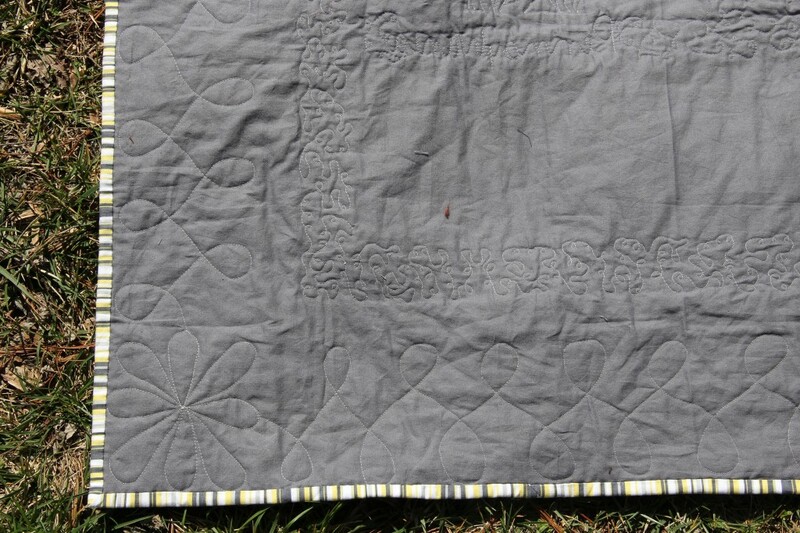 I love the look of the flowers and half flowers, and I feel like I was finally getting a grasp on free motion quilting by the time I quilted this block, so it looks nice and even as well. The back is pieced and includes a lot of my scraps from working on the Quilt Along blocks, as well as a couple of rejected blocks. I did a nice back and forth loop on the border (inspired by Amylouwho on instagram) with flowers in the corner. 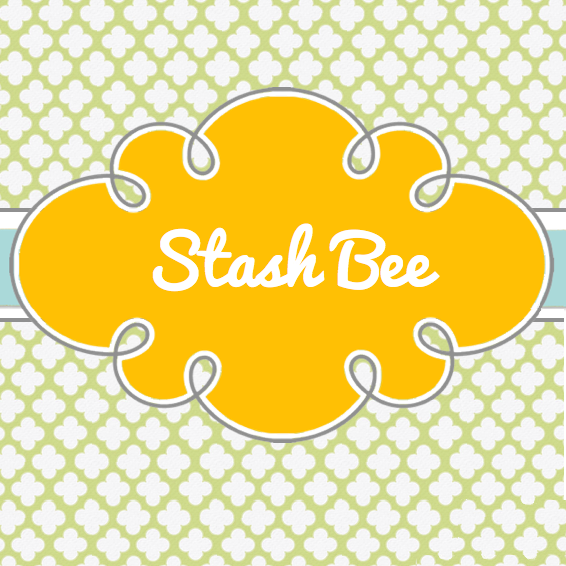 I love the stripe-y yellow and gray binding. 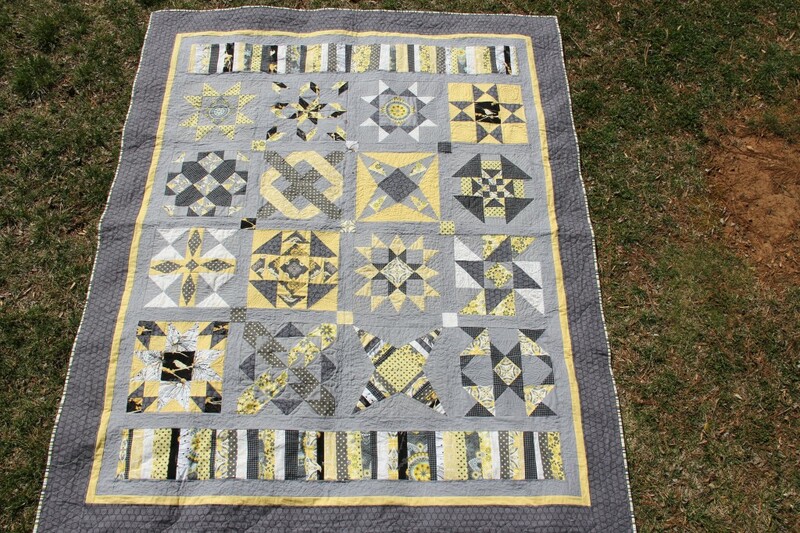 I am so proud of this quilt and the fact that I used it to learn free motion quilting. It’s reassuring to see my physical progress. I definitely need lots more practice, but you can see how far I’ve come. 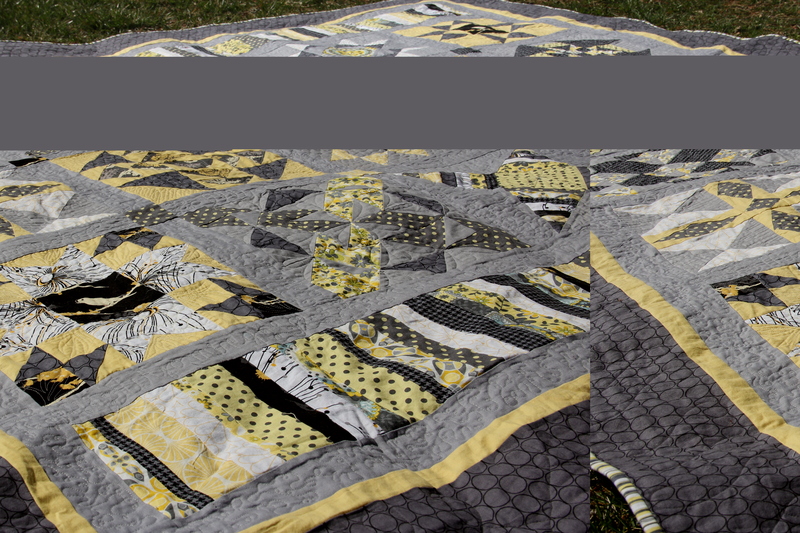 Below, you can see some pebbling I did in one of the first blocks I quilted on the left, and on the right, the same pattern in one of my later blocks. This quilt has taken residence in the living room, and in addition to a quilt, it has already been an elevator, the ocean, a hideout, and an animal home. I am sure it will be well-loved by our family! More fun finishes from the quilting world at Crazy Mom Quilts and Thank Goodness It’s Finished Friday. 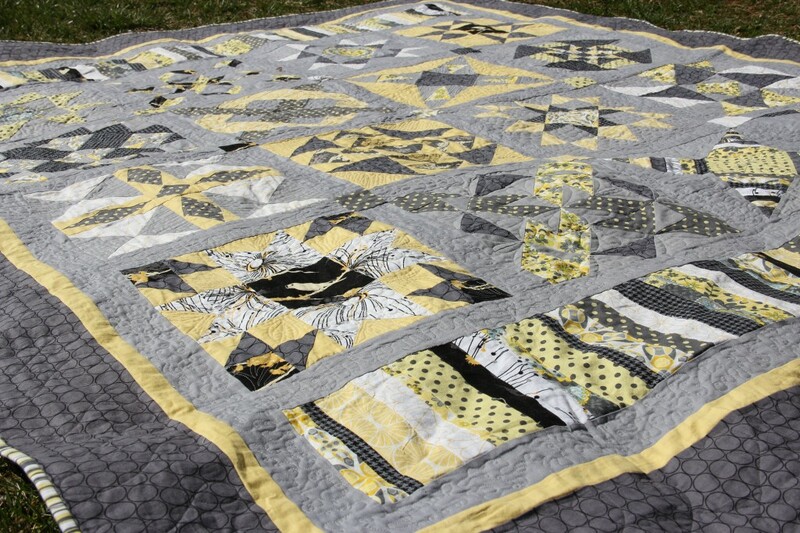 It`s simply beautiful and your quilting too!! You have done a most wonderful job quilting that on a home machine. I am still not ready yet to even attempt it yet. GRAET JOB. Kudos! I find it hard sometimes to just jump in and try a new technique when I’ve spent so much time (and $) piecing the quilt top together. I really want to give machine binding another try so maybe your finish here will spur me on. I know practice makes perfect but I want those practice items to look nice also! Adore the colors in your quilt. This is so pretty! 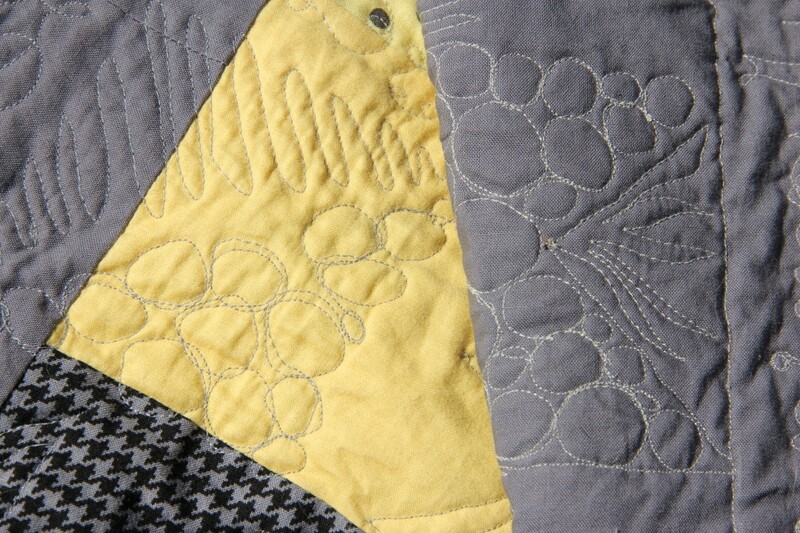 Love the color combination and your quilting makes it really special. You should be VERY proud!! This is stunning. I hope you’re keeping it – too nice to give away! 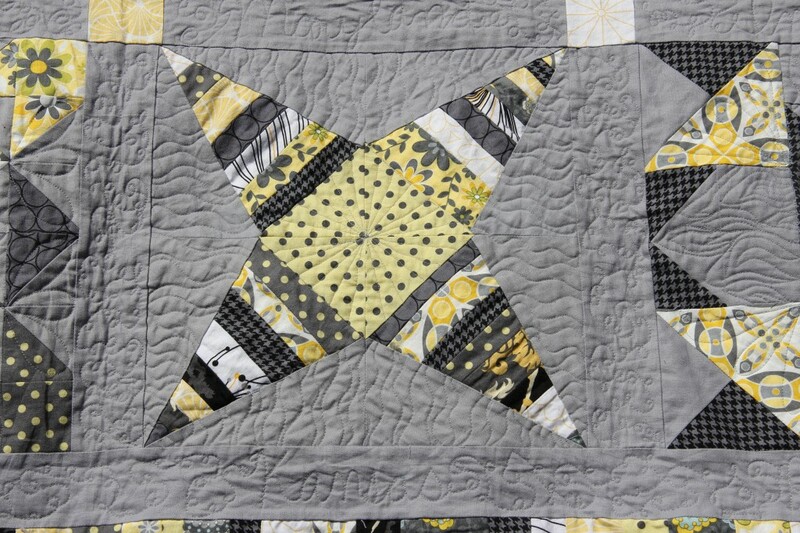 Beautiful quilting job, especially for your first FMQ. 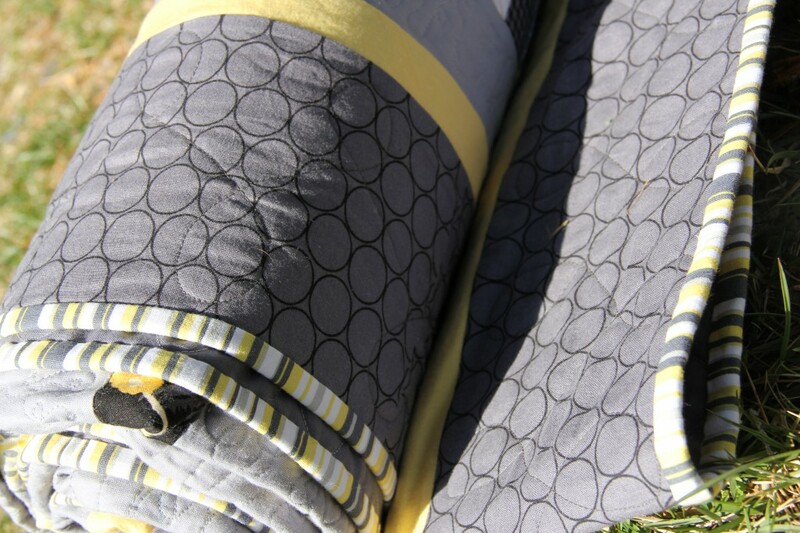 I am also learning free motion quilting and am currently taking a feather FMQ class on Craftsy. I’m surprised at how easy some of it is to pick up–you have encouraged me to try more things. Great Job! I love the color, it’s such a magnificent quilt. You should be real proud of it. It’s really pretty, Em. Nice work! I love your idea of doing a road trip quilt. 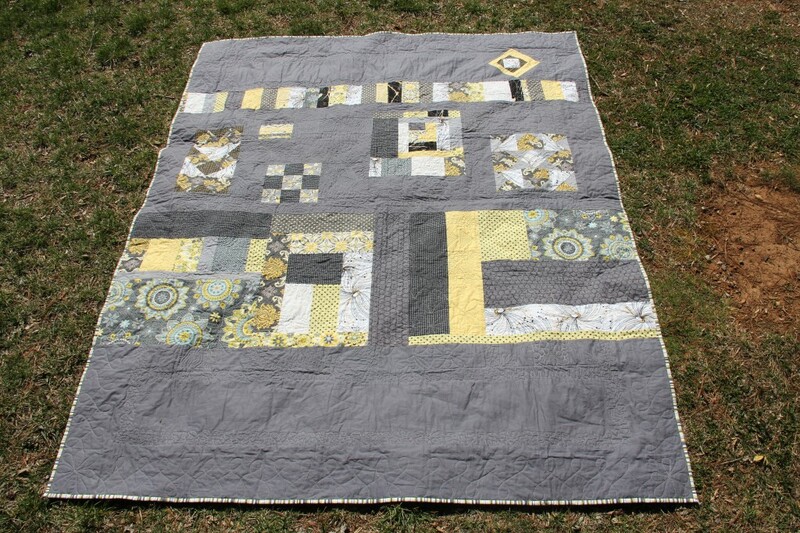 It’s beautiful finished and I do enjoy seeing your machine quilting. Thanks for sharing.